Flu and cold season is coming – is your body ready? You want to make sure your immune system is in good working order! I used to get colds all the time and was amazed once I cleaned up my diet and focused on nourishing myself for good health and doing seasonal cleanses, I got sick far less often. In fact, I almost never get colds anymore! I want to share some tips to naturally cleanse your body and help support your immune system so you too can feel better this fall and winter! The immune system is designed to work against infection and other diseases in your body. It has a resistive power that fights bad bacteria and viruses that can cause illness and sickness. The immune system is designed perfectly, but our negligence towards our health often weakens the system. If it is not properly cared for, it becomes so weak that even small illnesses like the flu or a cough can become severe. The immune system can also become weakened by fighting too much bacteria, stress and toxins. Cleansing is a key strategy to help make it strong again. There are many ways to cleanse to boost the power of the immune system. Here are some of the ways to do it naturally. Turmeric is a yellowish spice used in many dishes in Asia. It has proven beneficial in the treatment and prevention of many diseases. Very high in anti-toxicants, turmeric helps in fighting against free radical damage which speeds up the aging process and damages the body. Some studies have shown that an active ingredient in turmeric, curcumin, supports the action of B cells, T cells, and natural virus killers in the body. This effect provides support to fight against viruses, bacteria, and fungi. 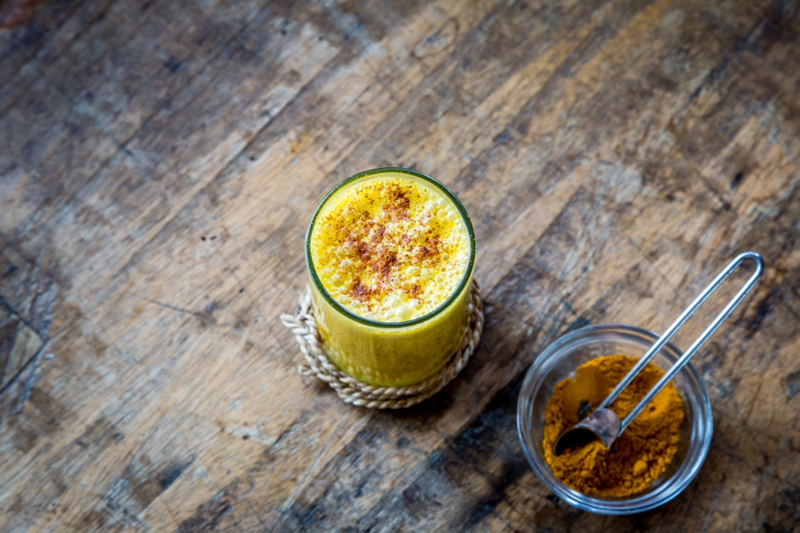 Add turmeric to your meals, drink golden milk (recipe at the end of this post) or take it as a supplement to keep your immune system strong and your body free from toxins. NOTE: If you have taken or are taking any chemo medications, please check with your doctor as turmeric may be contra-indicated. Vitamin D is also known as the sunshine vitamin. It is detoxifying and helps to keep the immune system strong. Deficiency of Vitamin D results in a weakened immune system and health problems and can also cause the “winter blues.” Vitamin D can be directly accessed from the sunlight but sun exposure has its own risks, so vitamin supplements are often indicated. They are easily available and can be taken daily with no side effects. Vitamin D3 is preferred over D2. You can also get good amounts of vitamin D from fatty fish such as salmon, mackerel and sardines (and cod liver oil! ), egg yolks and beef liver. Many people think of Vitamin C as the cure for the common cold! While this is a bit of an overstatement, this vitamin is critical for detoxification and a healthy immune system. It is easy to get Vitamin C from foods such as citrus fruits, strawberries, pineapple, bell peppers, broccoli, kale, brussels sprouts and also parsley. Beetroot, commonly known as beets (without the beet greens) is a reddish vegetable with a lot of benefits for the immune system. It helps to restore your body’s PH balance with minerals like iron, calcium, zinc, and magnesium. These minerals have very strong detoxifying properties. The high content of pectin and betaine found in beetroot also works as an anti-toxicant against bacteria. I love roasting beets – they are delicious alone or roasted with other veggies or chopped in a salad. The combination of apple and ginger helps to cleanse the body. The best thing is that it is very easy to prepare and store. Combine eight ounces of organic or freshly pressed apple with one teaspoon of ginger (or more if you love ginger as much as I do!). Mix them together, blend it or if you have a juicer, you can juice the ginger and apples together. Green tea can help cleanse your body and freshen your skin. It is tasty and can be made easily. It has many anti-toxicants that help to flush toxins from your body. “It’s all about the catechin content,” says Beth Reardon, RD, a Boston nutritionist. Catechins are antioxidants that fight and may even prevent cell damage. Lemon has natural cleansing properties. Although consuming lemon directly is slightly unpleasant, you can easily make a natural, healthy lemonade. Combine four tablespoons of lemon juice, a half teaspoon of maple syrup or a few drops of liquid stevia, and a half teaspoon of cayenne pepper (optional but good for you!) in a ten ounce glass of water. Mix well. I recommend drinking this daily. Add all the ingredients to a small pot over a low flame. Stir until the mixture becomes a paste. Store this in the refrigerator in an airtight container until you are ready to use it. Add all the ingredients to a small saucepan and stir gently until warm—not boiling. Serve in your favorite mug. I like to add a little minced ginger, some clove and cinnamon and strain but this is optional. I hope you find these tips helpful! I believe in cleansing seasonally to not only boost your immune system but also to reset and reboot your body. Fall is a great time to do a cleanse – CONTACT ME to find out about my seasonal detox program! Or visit my website: https://wellness-alternative.com/.